When Protestants killed Catholics and vice versa, which were the real Christians? Did real Christians save the Jewish people or did real Christians kill them? Are Christians of the Western churches, or Eastern Orthodox Christians, the real ones? After all, don't they disagree on what each maintains are soul-life and soul-death-deciding matters of faith? Which are real Christians, the executioners or the heretics they execute? 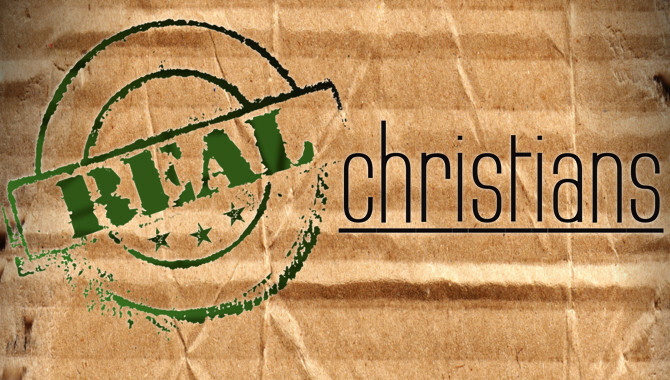 Is a real Christian a peacemaker or a soldier for Christ? Is a real Christian for or against abortion? Does a real Christian believe that Christ-God forgives anything, that no matter what wrong or evil a Christian does, “I'm sorry, God” will guarantee a clean conscience? Or does being a real Christian mean not committing offences in the first place? 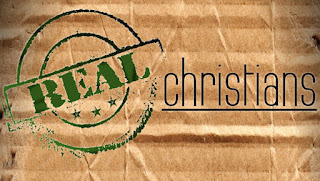 Do real Christians believe in or deny the divinity of Jesus? Do they embrace those amongst them who think differently or, following the command of St. Paul, cast them out from their companionship and declare them “anathema?” In any congregation, who are the real Christians, who aren't, including the pastor? Do real Christians believe “in God we trust,” while they wholeheartedly support the largest military/security intravenous system of any country on Earth? Why does the difference between a real Christian and a non-real Christian question come up?Why does the difference between a real Christian and a non-real Christian question come up? Do church leaders arbitrarily define the differences? Do they decide who is “spiritual,” who's not? By what right do they judge? Can they agree on what “spiritual” means? Every religion sells itself as “spiritual” and “revelation-founded.” But “spiritual experiences” and “revelations” are in the minds and emotions of individuals. Mass spirituality is emotional manipulation; religion is social and political manipulation. The most impressive churches, temples, and mosques are built from stone to last forever, but their ruins prove otherwise. They are constructed to be representations testifying to impregnable faith. Closer examination reveals faiths are dogmatic fantasies resembling more a cubist or surrealist painting than permanent structures. There is more personal “spirituality” in a symphony by atheist composer Shostakovich, writing under political repression, than in houses of worship. “Everything begins in mystique and ends in politics.” - Charles P'eguy. “Grandiose ideas are made ordinary with the passage of time and become fodder for a power struggle among idealogues and pedants.” - Alex Ross. Let's consider these words as they apply to religion: Everything that begins as holy becomes political. Religions become political over the passage of time and become fodder for power struggles among ideological factions. All religions end up becoming commercialized political power struggles. All begin as peaceful, become political, and then attempt to dominate society. This pattern is historical and universal. Everything religions begin in mystique becomes boringly ordinary and ends in politics. That's the mystery of real Christianity, to which real Christians belong.